What are some of the things you have bee doing to loose weight so far in 2007? I signed up for the National Body Challenged at http://health.discovery.com a tip i got from a friend here at mylot! You will get 2 months free at bally's to.I have been walking for 30 minutes and also doing my taebo.I also have been drinking plenty of water and diet green tea and eating healthier! I also joined the National Body Challenge. There is not a Bally around me though. I really just need to tone up again. I've gotten out of shape since having my boys. I am planning to buy a treadmill so I can walk. I live in the mountains and we have a lot of snow and it's hard to walk with the boys too. So with the treadmill I'll be able to do it while they are busy or sleeping. I am trying to get back into the water habit too. I joined sparkspeople.com a couple months ago and it makes it so easy to watch what you are eating and drinking. I have a healthrider and I think a treadmill will be better for me,tho i prefer walking out doors but for those rainy days i think im going to get a treadmill. I prefer walking outdoors as well but by the time I get home from work it is too dark and it is not safe around here at night. 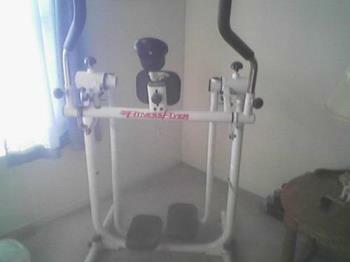 On weekends I go for walks and at home I use my fitness flyer machine and ablounge machine. I work out every mornign on a bike for about 20 minutes and have altered my eating habits. I have already lost a few pounds, and have only been doing it for 2 weeks. (though i have a pretty fast metabolism) also, i started eating breakfast and i think that helps as well. Good Luck! I don't need to lose weight, but i do need to prevent myself from gaining weight (in fat) so i will be eating better and not drinking as many sodas as before. I will also start jogging more often and working out. I want to gain muscle weight, not fat. I wish i could say that right about now,but will soon i hope! That is good taht you are eating bette!I can't drink to many sodas anyway because they will break me out.Anyways,Good luck! what does that cost you to join? oh no its totally FREE!!!!!! Congratulations on getting started on your fitness program and being on your way to losing weight and living healthier. Those are all great things to a great diet and healthier lifestyle. Hope many of us will follow you in your footsteps. I am using my fitness flyer machine every day for 30 minutes and eat fruits every day and veggies and salads. I've been lowering my caloric intake and taking my son out for more walks in his stroller, I used to walk 3 miles each night after work but can't do that now with it getting darker and colder earlier with it being winter now. yeah me to far as calorie intake i try not to go over 1200 calories now. Well, that's good for you. I do a treadmill 3 times a week for 20 minutes and do crunshes, stretches afterwards. I think it's great and it's working out for me. Thanks! Thats wonderful for you as well!Keep up the good work!